PROJECT GRANTOur project titled as A Smart- and Hybrid Manufacturing System Utilizing Additive Manufacturing Methods and Machining is to be funded by TÜBİTAK. Our paper titled as "Generation of Patterned Indentations for Additive Manufacturing Technologies" is available online now. You may view it from the following link. Papers titled as "Topology optimization of 2.5D parts using the SIMP method with a variable thickness approach" and "Comprehensive Analysis of the Shrinkage Compensation Approach Proposed for the FDM process" and "Tuning the Center of Gravity of 3D Printed Artifacts" are presented at the FAIM2018. Papers presented at ESAFORM2018 conferences are available online now and they are all open access. Our paper titled as "A novel command generation paradigm for production machine systems" is available online now. You may view it from the following link. Papers presented at FAIM2017 and ESAFORM2017 conferences are available online now and they are all open access. My paper on shrinkage compensation in FDM process is available online now. You may view it form the following link. I am co-organizing the workshop and will be giving series of seminars on different Additive Manufacturing methodologies. It will be held between 18 - 22 September, 2017. I will present our papers titled as "Formation of Patterned Indentations for Additive Manufacturing Applications" and "Current Trends and Research Opportunities in Hybrid Manufacturing" on September 2, 2017. Our project titled as A Smart- and Hybrid Manufacturing System Utilizing Additive Manufacturing Methods and Machining is to be funded by TÜBİTAK. "The undergraduate program of our department received full accreditation by Accreditation Board for Engineering and Technology, Inc. ABET." "The main purpose of this program is to provide the successful and motivated students within broad knowledge of mechatronics that will enable them to practice their profession in an interdisciplinary manner." The main purpose of the project is to develop a multi-axis hybrid manufacturing system that takes the advantages of traditional machining process and additive manufacturing techniques. The main aim of the project is to overcome the disadvantages of the current design and fabrication pipeline of 3D printer systems with a short pipeline and a compact command generation paradigm based on List Processors. This paper focuses on a novel command generator for servo-motor drives to be used as an integral part of their motion controllers. The method, which incorporates a new data compression algorithm, is capable of generating trajectory data at variable rates. In this paradigm, higher-order differences of a given trajectory (i.e. position) are first computed and thus the resulting data are compressed via the proposed technique. The generation of the commands is carried out according to the feedrate (i.e. the speed along the trajectory) set by the external logic dynamically. The paper discusses the implementation of the method on a Field Programmable Gate Array (FPGA). During implementation Very High Speed Integrated Circuit Hardware Description Language (VHDL) is used rather than using embedded processors on the FPGA chip. The performance of the method is assessed according to the resources used in the FPGA chip on the development board and these results are also compared with the same approach without an interpolator. This paper presents a new command generation technique titled VEPRO for computer controlled production machinery. In this method, the tool trajectory is described by a high-level scripting language that enables parametric representations of complex work-piece geometries. The interpreted script is then employed to generate the interpolation data required to compute a tool trajectory that is subjected to a number of kinematic constraints. A real-time interpolator is employed to provide the position commands required by each motion controller in a synchronous fashion. The latest industrial revolution, Industry 4.0, is encouraging the integration of intelligent production systems and advanced information technologies. Additive manufacturing (AM) is considered to be an essential ingredient in this new movement. In this paper, a comprehensive review on AM technologies is presented together with both its contributions to Industry 4.0. The review focusses on three important aspects of AM: recent advances on material science, process development, and enhancements on design consideration. The main objective of the paper is to classify the current knowledge (and technological trends) on AM and to highlight its potential uses. This paper presents a novel method for generating image projections required for Digital Light Processing type 3D printer systems where the entire cross-section of the printed object is directly formed via projecting the image onto a vat of photopolymers. The cross-sections (i.e. slices), which are initially represented as bitmap images, are compressed via a novel lossless compression technique which makes good use of relative data encoding. The coherence between the consecutive slices (or images) are taken into account in this proposed paradigm. The method yields satisfactory performance in terms of data compaction achieved in the test cases considered. In this study, an alternative method is proposed in which the strength of AM fabricated parts is improved employing direct slicing approach. Traditional Computer Aided Manufacturing (CAM) software of 3D printers takes only the geometry as an input in triangular mesh form (stereolithography, STL file) generated by Computer Aided Design software. This file format includes data only about the outer boundaries of the geometry. Interior of the artifacts are manufactured with homogeneous infill patterns, such as diagonal, honeycomb, linear, etc. according to the paths generated in CAM software. The developed method within this study provides a way to fabricate parts with heterogeneous infill patterns by utilizing the stress field data obtained from a Finite Element Analysis software, such as ABAQUS. According to the performed tensile tests, the strength of the test specimen is improved by about 45% compared to the conventional way of 3D printing. An interior design methodology to compensate for the shrinkage in the holes of artifacts fabricated with desktop 3D printers employing fused deposition modeling process is presented in this study. The method utilizes shrinkage as a tool to compensate for the shrinkage. The measurements with a coordinate measuring machine and the numerical analysis revealed that the proposed design approach can decrease the dimensional error substantially compared to the conventional 3D printed parts. This paper presents an embedded control system course for graduate-student education / research. This course, which is to provide hands-on-experience, employs “lab-at-home” approach where the students are expected to design and implement various embedded control systems at home rather than a formal lab environment. In this study, universal motion command generator systems utilizing a Field Programmable Gate Array (FPGA) and an interface board for Robotics and Computer Numerical Control (CNC) applications have been developed. This paper presents a comprehensive comparison of several real-time motion controller topologies implemented on a field programmable gate array (FPGA). This study focuses on advanced direct command generation paradigms that can be easily incorporated to modern servo-motor drive systems. As an alternative to conventional methods, two new command generation techniques are proposed in this paper. Polymorphic robotic systems, which are composed of many modular robots that act in coordination to achieve a goal defined on the system level, have been drawing attention of industrial and research communities since they bring additional flexibility in many applications. This paper introduces a new polymorphic robotic system, in which the detection and control of the modules are attained by a stationary observing camera. This paper focuses on a novel command generator for servo-motor drives to be used as an integral part of their motion controllers. The paper was selected as the best paper in the workshop. Conference Selected Ulas Yaman, Melik Dolen, and A. Bugra Koku. Ulas Yaman, Melik Dolen, and A. Bugra Koku. This paper focuses on a direct command generation technique for Computer Numerical Control (CNC) machine systems. In this paradigm, higher-order differences of a given trajectory (i.e, position) are computed and the resulting data are compacted via data compression techniques. This study focuses on an integrated software and hardware platform that is capable of performing (real-time/non-real-time) hardware-in-the-loop simulation of dynamic systems, including electrical machinery, CNC machine tools. Conference Serdar Usenmez, Baris R. Mutlu, Ulas Yaman, Ergin Kilic, Melik Dolen, and A. Bugra Koku. Serdar Usenmez, Baris R. Mutlu, Ulas Yaman, Ergin Kilic, Melik Dolen, and A. Bugra Koku. This paper presents a direct command generation technique for digital motion control systems. The paper illustrates that the ΔY10 technique, which is suitable for real-time hardware implementation, exhibits satisfactory performance in terms of data compaction achieved in the test cases considered. For the purpose of generating 2D curve offsets used in 2.5D machining, four new methods based on morphological operations on different mathematical entities are presented in this paper. As a part of a “lab-at-home” education paradigm for control engineering courses, this paper proposes (and elaborates) a novel hardware-in-the-loop simulator with 3D animation capabilities. The developed software, which can be tailored to simulate any dynamic systems in non-real-time, is designed to work in conjunction with a control hardware. In the paper, the specific application of the software to a graduate-level course is presented within the framework of a final term project involving the control of a satellite tracking antenna. A novel motion command generation paradigm for digital motion control systems is developed with in the scope of this dissertation. In the paradigm, the tool trajectory is firstly defined with the developed programming language on a host computer and then transferred to the machine with different communication protocols. The language proposed is capable of decompressing the previously compressed motion data via ΔY10 decompression algorithm and generating curve offsets of the base curve in inner and outer directions. With these abilities of the programming language and its hardware processor (VEPRO), the tool trajectory of a machining case can be presented with a few lines of commands. The hardware complexity of the VEPRO is low compared to the ones currently used in computer numerical systems such as Siemens Sinumerik and Fanuc 0i. Two-dimensional curve offsets have a wide application area ranging from manufacturing to medical imaging. To that end, this paper concentrates on two novel techniques to produce planar curve offsets. Both methods, which are based on mathematical morphology, employ the concept that the boundaries formed by a circular structuring element whose center moves across the points on a base curve comprise the entire offsets of the progenitor. 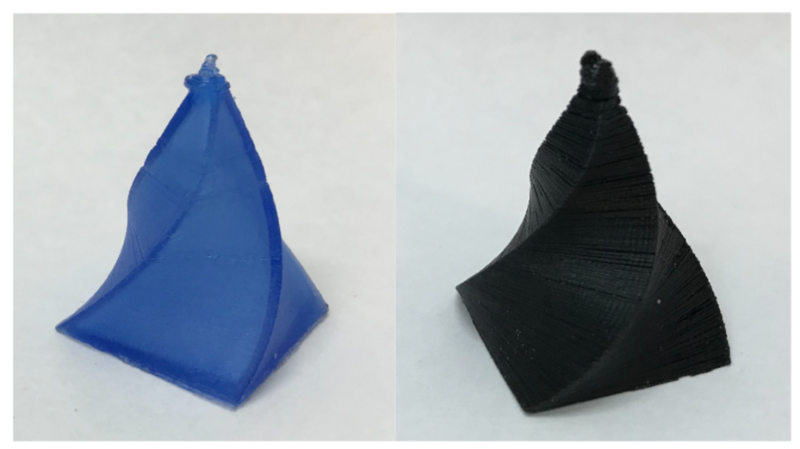 This study develops a novel command generation paradigm for desktop fused filament fabrication 3D printers. The proposed command generation paradigm overcomes most of the drawbacks of the conventional design and fabrication pipeline by taking advantage of the high redundancy of the motion trajectories of the printer heads. This paper proposes an alternative approach to improve the dimensional accuracy of the holes manufactured with Fused Filament Fabrication desktop 3D printers. We report on 3D printing of artifacts with a structured, inhomogeneous interior. The interior is decomposed into cells defined by a 3D Voronoi diagram and their sites. When printing such objects, most slices the printer deposits are topologically the same and change only locally in the interior. The slicing algorithm capitalizes on this coherence and minimizes print head moves that do not deposit material. This approach has been implemented on a client/server architecture that computes the slices on the geometry side. The slices are printed by fused deposition, and are communicated upon demand. The main purpose of the project is to develop a 5-axis hybrid manufacturing system that takes the advantages of traditional machining process and additive manufacturing techniques. The hybrid system, which will be developed for use on desktops, can be easily adapted to different dimensions, thanks to its modular structure and it will provide a suitable environment for testing advanced methods of manufacturing with its open architecture. The main aim of the project is to overcome the disadvantages of the current design and fabrication pipeline of 3D printer systems with a short pipeline and a compact command generation paradigm based on List Processors. This novel pipeline scheme will benefit from the high redundancy of the motion trajectory data of additive manufacturing applications and the query-based CAD/CAM architecture. High redundancy results from the following properties of the motion trajectories: i) the tool trajectory is mostly symmetrical due to the symmetry associated with the artifacts; ii) the simple offsets (biases) among the successive tool paths frequently appear in additive manufacturing over the shells or the interior; iii) there is high coherency between the consecutive slices. Consequently, the size of raw motion data (G-code files in the conventional pipeline) could be reduced and modified easily by making use of these attributes of the motion trajectories in additive manufacturing. An interior design methodology to compensate for the shrinkage in the holes of artifacts fabricated with desktop 3D printers employing Fused Deposition Mod- eling process is presented in this study. In the conventional way of compen- sating, the initial geometry is scaled according to the predictive and statistical models so that the critical dimensions will be more accurate when the part is cooled down. The proposed method employs a completely different paradigm. It constructs various interior structures to compensate for the shrinkage in the holes according to the geometric attributes of the artifacts. In other words, the method utilizes shrinkage as a tool to compensate for the shrinkage. Printed interior line segments, which are directly connected to the perimeter of the hole, simply pull the hole towards the inside of the artifact. In result, the dimensional accuracy of the hole is improved considerably. The measurements with a Coordi- nate Measuring Machine and the numerical analysis revealed that the proposed design approach can decrease the dimensional error substantially compared to the conventional 3D printed parts. TÜBİTAK 3001 – Başlangıç Ar-Ge Projeleri Destekleme Programı kapsamında desteklenen bu çalışmada 3B yazıcılar için LIPRO başlıklı yeni bir tasarım ve üretim akışı sunulmaktadır. Bu yöntemde, karmaşık iş parçası geometrilerinin parametrik bir biçimde tanımlanması için takım yörüngesi hareketleri yüksek seviyeli bir programlama dili ile üretilmiştir. Yorumlanan program kodları daha sonra bir dizi kinematik kısıtlamaya tabi tutularak takım yörüngesini hesaplamak için gerekli enterpolasyon verilerini oluşturmakta kullanılır. Her hareket kontrolcüsü tarafından ihtiyaç duyulan pozisyon komutlarının senkronize bir şekilde sağlanması için gerçek zamanlı bir enterpolatör kullanılır. Bu kavramı kanıtlamak için, önerilen yöntem Python kodlama dili kullanılarak bir bilgisayara uyarlanmıştır. Yaklaşımın performansı, farklı üretim tekniklerini içeren iki test vakası (örn. Cep frezeleme ve 3B baskı) ile titizlikle değerlendirilmiştir. Bu çalışma, deneysel sonuçlar ile gerçek zamanlı donanım uygulamalarında kendini ispatlamış ve tüm yoğun çalışmalarda tatmin edici bir performans sergileyip yöntemin geniş bir üretim yelpazesi için teknik olarak uygulanabilir olduğunu göstermiştir. 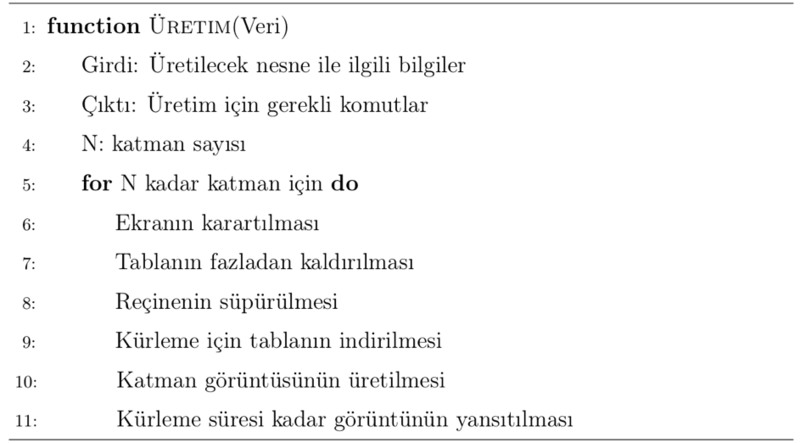 Destek ve yardımlardan dolayı TÜBİTAK’a teşekkür ederiz. Geliştirilen komut üretim yaklaşımı kullanılarak 3B yazıcılar özelinde yeni bir tasarım ve üretim akışı oluşturulmuştur. Python programlama dili ile gerçekleştirilen bu yaklaşımda List veri yapısı sıklıkla kullanıldığı için akışa LIPRO (List Processor) adı verilmiştir. Geleneksel tasarım ve üretim akışından farklı olarak nesneler Python dili ile geometrik olarak tanımlanmaktadırlar. Tanımlanan geometride ufak değişiklikler yaparak aynı kod parçasıyla farklı nesneler üretilebilmektedir. Dolayısıyla nesneler doğrudan modelleme yerine dolaylı modelleme yardımıyla tanımlanmaktadırlar. Dolaylı modelleme yaklaşımının kullanılamadığı durumlarda (örneğin karışık geometriye sahip parçalar) nesnelerin dilimleri bir veri yapısı içerisinde LIPRO’ya beslenir. Böylelikle LIPRO’nun diğer avantajlarından faydalanılmaya devam edilir. İki farklı eklemeli üretim teknolojisi (FDM ve DLP) üzerinde gerçekleştirilen LIPRO’nun uygulama detayları takip eden alt bölümlerde anlatılmıştır. LIPRO’nun FDM üzerindeki uygulaması için Ultimaker 2 Go isimli masaüstü FDM yazıcısı kullanılmıştır. Bu yazıcı sadece PLA malzemesini kullanabildiği için çalışma sırasında da sadece PLA malzemesi kullanılmıştır. Geleneksel yaklaşımda üretilen G komutları SD kart aracılığıyla yazıcıya aktarılmaktadır. Sonrasında yazıcının genel denetimini sağlayan Arduino Mega mikrokontrolcüsü G komutlarını işleyerek üretimi gerçekleştirmektedir ve üretim sırasında herhangi bir değişiklik yapmak mümkün değildir. LIPRO’nun Tip 2 uygulamasını (mikrokontrolcünün aradan çıkarılması) bu yazıcı üzerinde yapmak uzun zaman gerektireceği için Tip 1 (sadece LIPRO koşan bir tek kartlı bilgisayar kullanılması) ve Tip 2 (üretimin tamamı için gereken G komutlarının LIPRO ile üretilip SD kart ile aktarılması) arasında kalan bir uygulama gerçekleştirilmiştir. Bu ara uygulamada Arduino Mega’ya USB üzerinden bağlanan Raspberry Pi 3 bilgisayarı kullanılmıştır. Raspberry Pi 3 üzerinde koşan LIPRO her katman için üretmiş olduğu G komutlarını Arduino Mega’ya beslemektedir. Dolayısıyla katman sayısı kadar mikrokontrolcü ve tek kartlı bilgisayar arasında transfer gerçekleşmektedir. Komutlar gönderildikten sonra Arduino Mega bunları işleyerek geleneksel akışta olduğu gibi üretimi gerçekleştirmektedir. Bu uygulamada LIPRO’nun sunmuş olduğu avantajlardan yararlanmak mümkündür. LIPRO’nun başarımını göstermek amacıyla Şekil 1’de gösterilen parça geleneksel ve LIPRO yaklaşımlarıyla üretilmiştir. LIPRO ile üretim sırasında Rasberry Pi 3 üzerinde koşturulan Python dosyasının ana hatları Şekil 2’de sunulmuştur. Parça ile ilgili geometrik bilgiler ve baskı değişkenleri girildikten sonra Arduino Mega ile iletişim kurulmakta ve üretim başlatılmaktadır. PLA malzemesi ekstrüde edilmeden önce başlangıç için gerekli ayarlar yapılmaktadır. Üretim için gerekli komutlar katmanlar halinde yazıcının mikrokontrolcüsüne gönderilmektedir. Üretim bittiğinde gerekli komutlar çalıştırılarak yazıcı bir sonraki üretime hazır hale getirilir. Şekil 1’de sunulan parçanın üretimi için yazılan LIPRO üretim kodunun ana hatları Şekil 3’te sunulmuştur. Polygon fonksiyonu kare oluşturmak için kullanılmakta olup Offset fonsiyonu yardımıyla katmanların kabukları oluşturulmaktadır. Böylelikle istenilen kalınlık elde edilir. 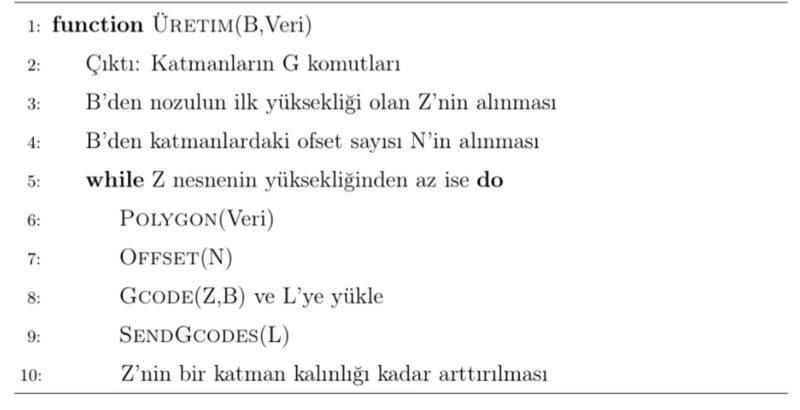 Üretilen kafa yörüngeleri Gcode fonksiyonu yardımıyla G komutlarına dönüştürülür ve SendGcodes ile 3B yazıcıya gönderilir. Bu işlemler katman sayısı kadar tekrarlanır. Parça özelinde çalıştırılan homojen dönüşüm komutu ile üçgen yapı her katmanda 0.1 radyan döndürülür ve Şekil 1’de sunulan parça elde edilir. Geleneksel ve LIPRO yaklaşımları ile üretilen parçalar Şekil 4’te sunulmuştur. Parçalar arasında herhangi bir fark bulunmamaktadır. İki yaklaşımda kullanılan dosyaların boyutları (kB) Tablo 1’de verilmiştir. LIPRO’un bu konudaki üstünlüğü açıkça görülmektedir. LIPRO’nun diğer büyük avantajı olan esnekliği göstermek amacıyla Şekil 3’te sunulan dosya üzerinde ufak değişiklikler (kenar sayısı, dönme açısı, vb.) yaparak Şekil 5’te gösterilen farklı parçalar üretilmiştir. Örnek bir FDM uygulaması aşağıdaki videoda sunulmuştur. LIPRO’nun DLP üzerindeki uygulaması için B9Creator v1.2 isimli masaüstü DLP yazıcısı kullanılmıştır. Geleneksel DLP tasarım ve üretim yaklaşımında üretilecek olan parçanın STL dosyası elde edildikten sonra, yazıcının kendi yazılımı aracılığıyla, parçanın tabla üzerindeki yerleşimi yapılır. Yazılımın ilk modülünde yapılan bu dizim sonrasında ikinci modül kullanılarak istenen kalınlıkta dilimleme yapılır ve parçanın katmanlarının görüntüleri oluşturulur (1920:1080). Siyah ve beyaz olan bu görüntülerin boyutları (6 MB) fazla olduğu için katmanların tamamı (500 katmanlı bir üretimin toplamı yaklaşık 3 GB tutmaktadır.) özel bir sıkıştırma yöntemi kullanılarak sıkıştırılır ve kabul edilebilir boyutlara (2-3 MB) getirilebilir. Sıkıştırma yöntemleriyle ilgili ayrıntılı çalışmalar uluslararası konferans bildirisinde tartışılmıştır (Yaman vd., 2017). Yazılımın üçüncü modülü ile üretim başlatılır ve katmanlar sırasıyla projektöre yansıtılır. Görüntünün beyaz olan kısımlarına denk gelen fotopolimerler kürlenerek katılaştırılır. Katman sayısı kadar tekrarlanan bu işlem neticesinde nesne üretilir. FDM yaklaşımında olduğu için üretim başlatıldıktan sonra herhangi bir tasarım ya da parametre değişikliği yapmak mümkün değildir. Şekil 6’da kullanılan B9Creator v1.2 DLP yazıcısının ana parçaları gösterilmiştir: projektör (1), Arduino Uno ve motor sürücüleri kartı (2), z ekseni adım motoru (3), x ekseni DC motoru (4), vidalı mil (5) ve eksen sonu anahtarları (6). FDM yazıcılarına göre elektro-mekanik mimarisi daha basit olan bu DLP yazıcısı üzerinde LIPRO’nun Tip 2 uygulaması gerçekleştirilmiştir. Oluşturulan yeni mimari Şekil 7’de sunulmuştur. 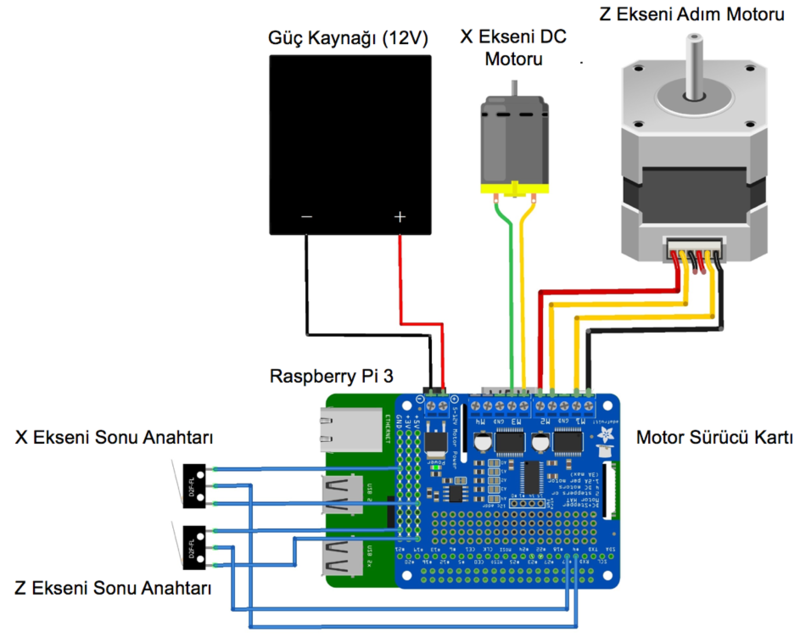 Raspberry Pi 3 ile motorları sürebilmek için üzerine bir motor sürücü kartı takılmıştır. Adım motoru ve DC motoru sürebilmek için gerekli bağlantılar yapılmıştır. Eksenlerin sıfır konumlarını okuyabilmek için kullanılan anahtarlar sayısal girdiler olarak Raspberry Pi 3’e beslenmiştir. Projektör de HDMI çıkışı ile tek kartlı bilgisayara bağlanmıştır. DLP uygulaması için Rasberry Pi 3 üzerinde koşturulan Python kodunun ana hatları Şekil 8’de verilmiştir. FDM uygulamasında olduğu gibi üretimi başlatmak ve sonlandırmak için birçok ayarın gerçekleştirilmesi gerekmektedir. Üretim fonksiyonunun ayrıntıları ise Şekil 9’da sunulmuştur. Katman sayısı kadar tekrarlanan kürleme işlemleri sonrasında parça kullanıma hazır olmaktadır. Geleneksel ve LIPRO yaklaşımları ile üretilen parçalar Şekil 10’da sunulmuştur. Parçalar arasında herhangi bir fark bulunmamaktadır. İki yaklaşımda kullanılan dosyaların boyutları (kB) Tablo 2’de verilmiştir. LIPRO’un bu konudaki üstünlüğü açıkça görülmektedir. FDM uygulamasında olduğu gibi aynı Python kodunda ufak değişiklikler yapılarak farklı parçalar DLP yazıcısı ile de üretilebilmektedir. Örnek parçalar Şekil 11’de sunulmuştur. En sağdaki parçanın üretimi sırasında fotopolimer şişesi çalkalanmadığı için şeffar bir parça elde edilmiştir. Ayrıca bu parçanın üretimi sırasında katmanlar belirli bir yükseklikten sonra döndürülmüştür. Örnek bir DLP uygulaması aşağıdaki videoda sunulmuştur. I will probably be teaching ME 533 - Computer-Aided Design and ME 495 - 3D Printing and Additive Manufacturing in the upcoming Fall semester. I taught CS 250 - Computer Architecture in the Department of Computer Science. I assisted the following courses at least for one semester: ME 200, ME 205, ME 206, ME 210, ME 212, ME 303, ME 304, ME 307, ME 308, ME 407, ME 410, ME 414, ME 440, ME 445, ME 448, and ME 534. I am an Assistant Professor in the Department of Mechanical Engineering at ODTÜ. 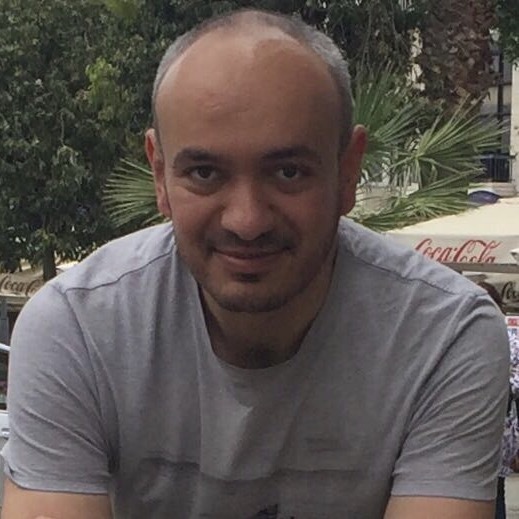 I am an Assistant Professor of Mechanical Engineering at ODTÜ since October 2015. I received my PhD (2014), MSc (2010), BSc (2007) in Mechanical Engineering, and Minor in Mechatronics (2007) degrees from the same university. I was a Visiting Assistant Professor of Computer Science at the Purdue University from July 2014 to October 2015. My research interests include 3D printing and additive manufacturing, CAD/CAM architectures, command generation, FPGA-based embedded systems and computational geometry for design and manufacturing.